East Thurrock United lifted the Essex Senior Cup for the first time in their history, as they got their own back on National League South rivals Chelmsford City who beat them to lift the trophy in the 2017 final. East Thurrock took the lead within less than 40 seconds of the kick off, when John Coventry ‘s side went straight on the attack and, following a defensive mix-up Danny Harris slotted the ball past Chelmsford goalkeeper Nathan McDonald to put his team in front. Then Ben Marlow stunned the Clarets again as he put East Thurrock 2-0 in front in the 5th minute, after another sloppy piece of defending from Rod Stringer’s side. But then Chelmsford started to create a few opportunities and in the 13th minute Chez Isaac had a good effort, with a right footed shot that went just side of the goal, but as the half went on City were continually frustrated by a hard working East Thurrock side who fought hard to win every ball. Michael Spillane had a chance for the Clarets in the 36th minute when he nodded on Isaac’s free-kick, but his header was comfortably caught by Rocks goalkeeper Jack Giddens and the Corringham based side led at the interval. In the 53rd minute Chelmsford’s Chris Whelpdale set off on a marauding run from his own half before being brought down on the edge of the penalty area, but the resulting free-kick from Jonny Giles went sailing over the bar. 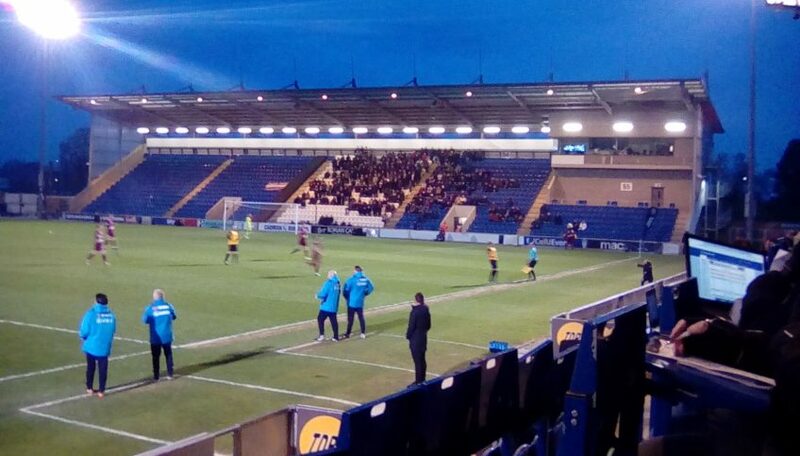 In the 71st minute Rocks captain and former Chelmsford striker Sam Higgins almost made it 3-0 after latching on to a cross, but a minute later the Clarets were suddenly back in it as Spillane slotted the ball home at the other end to reduce the deficit. But just 2 minutes later at the opposite end, after City’s Elliot Omozusi was beaten to the ball Higgins crossed for Alex Osborn, who fired a superb right footed strike past McDonald to put East Thurrock 3-1 ahead and there was no way back for the Clarets after that, although they were denied what looked like a clear penalty when Jordan Chiedozie went down in the box, and Anthony Church hit the woodwork six minutes from the end. 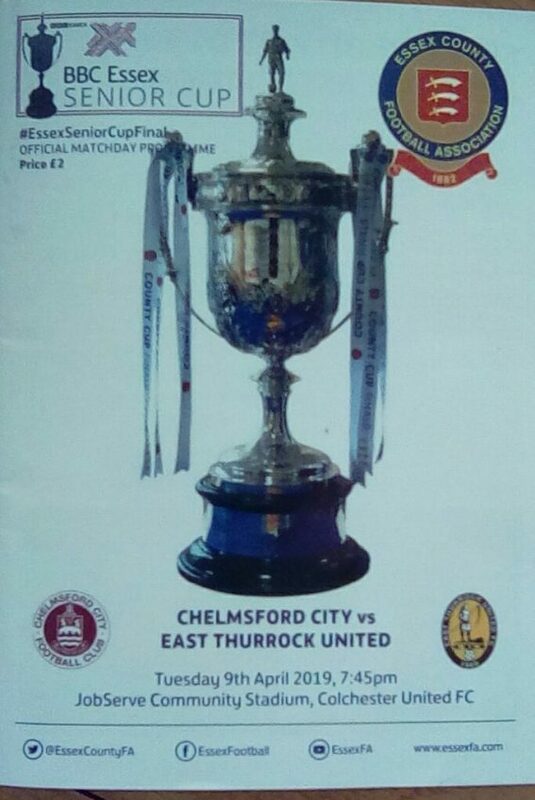 So East Thurrock took the silverware home after what for some will have been a surprise result, given the teams’ very different league positions but Chelmsford never recovered from the two errors which saw them concede twice in the opening five minutes of the game, and their opponents took the initiative. Chelmsford City: Nathan McDonald, Jazzi Barnum-Bobb, Chris Gregan (Elliot Omozusi 61), Michael Spillane, Adrian Cascaval, Jonny Giles, Chez Isaac, Anthony Church, Chris Whelpdale, Aaron Cosgrave (Jordan Chiedozie 61), Scott Fenwick (Max Porter 69). East Thurrock United: Jack Giddens, Lee Burns, Ibrahim Sori Diallo, Ben Marlow (John Nzengo 55, Shaun Batt 75), Ryan Scott, Steve Sheehan, Alex Osborn (Calvin Ekpiteta 89), Reece Prestbridge, Sam Higgins, Harry Lee, Danny Harris.